Junior NMSU-HHMI Research Scholar Luke Sanchez was named student regent to the NMSU Board of Regents by Governor Lujan Grisham. Luke was appointed to a two-year student regent term through December 31, 2020. Luke is pursuing a bachelor’s degree in biology and has been working as an emergency department medical scribe at the Mountain View Regional Medical Center and has various community service experience (Kemp Kesem director, member of the NMSU Outdoor Leadership Program and presidential ambassador (Sun News, February 27, 2019). On May 29, 2018 HHMI approved a revised sustainability plan in which they are providing the NMSU-HHMI program $380K to spend over the next two years on BioCats, the Biol CURE course, a new “Introduction to Scientific Thinking” seminar for early career students, and two cohorts of a restructured 1- year Research Scholar Program. on May 21, 2018 HHMI announced that it plans to suspend indefinitely the HHMI Exceptional Research Opportunities Program (EXROP). The current class of 58 first-year EXROP students and the 23 second-year “capstone” EXROP students will engage in their 2018 summer research experience, and the 2018 EXROP alumni will be offered the opportunity to do a capstone experience with their 2018 labs in the summer of 2019 but a new competition will not be offered in the fall of 2018 (HHMI). Nubia Rivas, a senior Biology major and NMSU-HHMI Research Scholar, placed first in the undergraduate poster presentation at the 66th Annual Meeting of Southwestern Branch of the Entomological Society of America, March 25-29. The meeting was held in Albuquerque. We can announce that the Honors College International Research Scholarship was awarded to Trung Nguyen. The Honors College Scholarship at NMSU awards $5000 for recipients to promote an independent research experience by self-generated international travel to the host country of their choosing. Trung is a Genetics and Biotechnology major and a Howard Hughes Medical Institute (HHMI) scholar working with Dr. Barbara Lyons researching the role of protein kinase A (PKA) as a causative agent for a rare form of liver cancer. Trung’s project will take him to Fukushima Medical University (Japan) to conduct independent research aimed at improving our understanding of this disease’s pathogenesis. The goal of the Howard Hughes Medical Institute’s (HHMI) Exceptional Research Opportunities Program (EXROP) is to ensure that a diverse and highly trained workforce is prepared to assume leadership roles in science, including college and university faculty who have the responsibility to develop the next generation of scientists. The EXROP Program links the resources of HHMI’s Science and Science Education departments to provide bright, motivated undergraduate students from groups traditionally underrepresented in the sciences with outstanding summer research experiences. HHMI continues to work with EXROP students after their summer study programs to encourage them to pursue careers in academic science. NMSU Honors College student, Clara Hansen shares the research she conducted in Uruguay over a period of eight weeks in summer 2017. This research was made possible through the Honors College Scholarship and Aggies Go Global. The College of Arts & Sciences has selected NMSU-HHMI alumna, Alejandra Lerma, as Outstanding Senior for Spring 2017. She also was awarded the Dean’s Undergraduate Award for Excellence. Alejandra graduated from the NMSU-HHMI Program in 2016. Alejandra will graduate from NMSU in spring 2017 with a Bachelor in Animal Science, Biology and Women’s Studies. As a Research Scholar of the NMSU-HHMI Program (2013-2016) she worked in the lab of Dr. Ryan Ashley in the department of animal science. Congratulations! Senior Research Scholar, Dylan Gallegos, from the Hanley lab, won the award for best undergraduate oral presentation at the meeting of the Rio Grande branch of the American Society for Microbiology on April 8, 2017 at NMSU. Congratulations! Each year the Honors College at NMSU gives one or more awards to facilitate research over the summer in an international context. On Friday they interviewed the finalists for this prestigious award and selected Clara Hansen (biology) as the winner, with three additional students receiving smaller awards as Honorable Mentions. The research the students propose are all in STEM fields and they will be working in Uruguay, France, Germany, and Korea.The Honors College is working with other units on campus to help ensure adequate funding to realize these research plans, and is grateful to Gary Lowe and Aggies go Global for continued help for these deserving students (Activity Report Provost Office, March 11-17, 2017). Also, Biology major and NMSU-HHMI Research Scholar, Sydney Salas, received Honorable Mention for the scholarship and will be receiving some support for her summer research project in France on squid-microbe interactions. By Vince Gutschick, Board Chair Las Cruces Academy. Ten of our students in grades 3-8 visited the research laboratory of Prof. Graciela Unguez for 3 hours. She and her group study weakly electric fish (Stenopygus species), who use their electrical sense to find food and avoid predators. They also can regrow their tails, providing a great study of tissue development, as well as genetics and physiology. The students along with Head of School Dr. Lou Ellen Kay and Board Chair Dr. Vince Gutschick caught the Las Cruces bus near our school and rode to campus. Graciela’s undergraduate students had laid out about 8 stations, where our students could learn about the fish with hands-on activities. Check out the pictures with students using the detector of the fish’s electric fields, and also the fish themselves, both hiding in favorite tubes or swimming with ethereal fins. At the end of the visit, many of us participated in a game of navigating by touch (hula hoops). Please congratulate NMSU-HHMI Junior Research Scholars Eliana Griego (Brad Shuster lab) and Dante Avalos (Erik Yukl lab) for being accepted into the HHMI EXROP (Exceptional Research Opportunities Program). Application to the program is by nomination only and is open to undergraduate students who are from racial, ethnic, and other underrepresented groups in the sciences. EXROP students who pursue the PhD degree will be eligible for continued HHMI support in their PhD training through the Gilliam Fellows program. Congratulations to NMSU-HHMI Research Scholars Lynsey Kovar for winning the 30th annual Biosymposium “Best Undergraduate Talk”, and Aldo Ramirez and Cindy Buraczyk for sharing first place in the category “Best Undergraduate Poster Presentation”. LAS CRUCES – A couple of weeks ago, professor Ralph Preszler retired from New Mexico State University. Now, the former biology department head is off the grid. “It’s another adventure,” he said of his retirement. Since the start of April, Preszler has swam in the Gila River, camped in the Guadalupe Mountains and made plans to brush up on his Spanish for a future trip to Patagonia. With more than two decades of service to the College of Arts and Sciences, Preszler watched the biology department evolve from blackboards and handwritten reports, to interactive “flipped” classrooms and lectures in professional-level research facilities. “I think the way we teach is much more engaging now, than it was when I started out,” Preszler said. As a longtime director of NMSU’s Howard Hughes Medical Institute – a nationally-recognized program providing biological and medical research funding – Preszler introduced the department to curriculum reforms for lower level biology courses, and paved the way for peer instruction and faculty-mentored undergraduate research. “What I admired so much about Ralph was his teaching and commitment to undergraduate education. He’s an incredibly creative teacher,” said Michele Shuster, associate professor of biology and NMSU-HHMI program director. Preszler also served as mentor for students like Chiann-Ling Cindy Yeh, an NMSU-HHMI research scholar and senior genetics and biotechnology major. In 2015, Yeh was awarded the Barry Goldwater Scholarship, a highly competitive national award that supports outstanding students in the fields of math, science or engineering. This fall, she will begin graduate school at the University of Washington’s Department of Genome Sciences. Preszler said some of his favorite memories of his time at NMSU include seeing undergraduates mature into nationally competitive researchers. He began his work improving undergraduate education in 1993 as a postdoctoral researcher studying plant and insect ecology, joining the NMSU biology department fresh from graduate school at Northern Arizona University. When his funding ended, he accepted a staff position in the department to design new teaching laboratories for students. Nearly 20 years after joining NMSU as a postdoctoral researcher, Preszler was appointed as academic head of the Department of Biology, a position he held for four years until his retirement March 31. 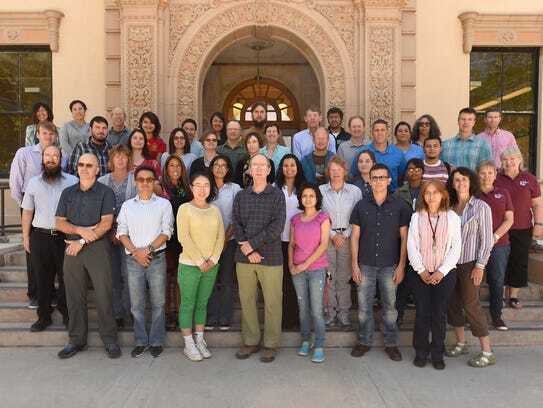 In recognition of Preszler’s 23 years of service to the biology department, dozens of faculty, staff and students gathered on the steps of Foster Hall for a group photo earlier this month. Dana Beasley writes for University Communications and can be reached at danab@nmsu.edu.